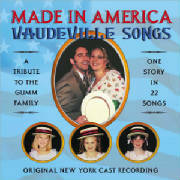 This site tells the story of the "Made In America - Vaudeville Songs" project. Work on this project began in 1995 and was concluded in 2005 with the re-release of our cd. This new version includes 7 redone tracks with added instruments, two new vocalists, and one newly discovered song. To learn more about this version, please click below. To learn more, visit our www.vaudeville.com site! You can buy the CD online now! To order of a copy of the original Made In America CD, CLICK HERE! Alexanders Ragtime Band, You Made Me Love You, By the Light of the Silvery Moon, Carolina in the Morning and more. These are melodies that never age. The cast is perfectly chosen... I adore this collection. Thank you for all the work you put into it!"